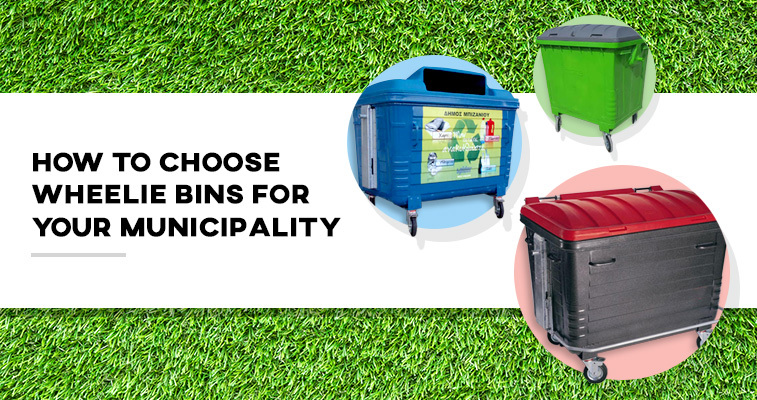 If you are a municipal authority, and you are engaged with urban and environmental development in your city, then you would want to know everything about choosing the right wheelie bins for the municipal waste collection and a solid waste management system. So, look no further. We have created an overview of the topic here, and we are going to walk you through the steps of choosing the right containers for your municipality. Municipal solid waste is always going to consist of the household waste, construction and demolition debris, sanitation residue, and the waste picked from the streets. However, depending on the size of the municipality, there is going to be a difference in your everyday work if you are making a strategy for the waste collection. If you are, for example, managing a small coastal town on the French Riviera, you are going to need smaller steel bins because of the narrow streets and the limited access for the garbage trucks. On the other hand, if you are creating a strategy for a new and improved waste management system in Mexico City, for instance, you are going to need a lot more sideload containers with various capacities for that matter. All those 8 million residents would need to have the proper amount of waste containers and you would want to maintain the efficient waste transportation system, right? Here is one fact: if you carefully manage the size and positioning of waste containers throughout the city, by making them easier to reach, there is no doubt that the waste collection would become significantly improved. Smart management can also make a recycling system more popular among the citizens in your area. So, how do you choose the wheelie bins for your municipality? Is it built out of a strong high-quality material? Can it be protected from theft? How convenient is it for the everyday use? Is it protected from corrosion? Is it easy to move around and can it be safely lifted? Would it fit aesthetically into the urban surroundings? Has it been produced by a licensed company? Once you get all the answers you need, you can step further into the process, depending on the estimated waste amount. For small amounts of waste, you don’t need big containers. That is why we recommend using eassily accessible containers on wheels ranging between 660 and 1100 liters of capacity. It is important to make sure these are made from the high-quality steel, proven to be durable and resistant to mechanical stress. You could ensure the corrosion protection and the resistance to all weather conditions by choosing hot dip galvanized containers, equipped with two or four side handles for an easy movement. Additionally, you may opt for a bottle or paper aperture within a lid. For a bit bigger amounts of the estimated municipal waste disposal, you may consider choosing the medium-size steel waste containers. These usually have the capacity of up to 1700 liters, and besides ensuring that containers are built in durable material, you should also look for the conically shaped bins with a pedal opening to provide easier discharge. Also, look for the ones with a central brake designed to prevent unauthorized movement. This type of containers could be a good choice for the recycling management, as these can be constructed for flat, bottles, cans, and paper loading. Sideload containers ranging between 2400 and 3200 liters in capacity could be a good choice for larger amounts of the solid waste disposal in your municipality. Make sure that the ones you choose can provide high endurance and structural stability. Containers should be fire resistant as well and secured for the theft with a wheel lock. When it comes to the functionality, you should consider sideloading containers with a wide symmetrical lid that can be opened from both sides. Also, mind the significance of an easy approach for the garbage trucks and look for containers that provide both front and rear loading and dumping. We hope that this overview can help you decide which wheelie bins you are going to use within your municipality. If you are still unsure of the steel containers that could fit your managing system, feel free to comment on this article or write to us on our Facebook page.